Along with cheesecake, this Victoria sponge cake is still one of my favourite bakes – once you have mastered it. I find the beauty of baking a classic sponge cake recipe is that it can always be adapted and decorated in so many different ways. But is always fabulous with just a simple jam filling. 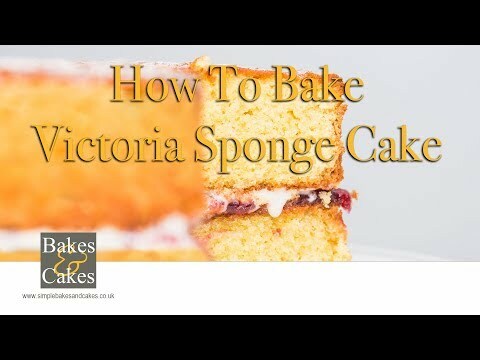 This Victoria sponge cake is a simple mix of just 5 ingredients and has equal amounts of; sugar, flour and butter. That’s always the secret – equal amounts. I also find mixing the ingredients in a stages lets you incorporate enough air in the cake mix to give you that perfect rise. This helps you make it perfect every time. Once baked and cooled, you can fill it with a simple layering of jam and butter icing cream or decorate more elaborately depending on your requirements. This particular Victoria sponge cake recipe started life as one of Mary Berry’s collection of basic bakes but I have tweaked the ingredients slightly. I like a fully, deeper sponge cake – one you can really get your teeth into and looks very impressive when plated up. Whilst you at it, why not try Mary Berry’s chocolate brownies recipe. They are superb. So delicious! If you want to scale up your recipe to suit your baking tin, take a look at my recipe converter. Makes: 2 x 20cm cake tins sandwiched together. Line each tin base and butter all round. Pre heat your oven to 160 degrees centigrade. Fold in the self-raising flour, again until everything is incorporated, but do not overwork. Test by placing a knife in the centre of the cake and if it comes out clean the cake is baked. Run a knife around the edges of the tins and tip out the sponge onto a wire rack. Remove parchment paper and leave to cool completely. Add jam/filling to one cake then invert the other on top and sprinkle with extra caster sugar/topping. Let me know how you get on and what your favourite filling is by commenting below and I would really appreciate it if you could click SHARE on Facebook.